4. The biggest adjustment I’ve had to make is: I’m currently unable to work outside the home. I’m a licensed preschool teacher and teaching was more than just a job for me; it was a passion. I miss working with children every day of my life and look forward to the day that I am able to manage my migraines in such a way that I am able to resume teaching. 5. Most people assume: Most people in my life are pretty good at understanding that a migraine is not just a headache. The assumption that is most difficult in my life has to do with managing my migraines versus curing them. Because I have tried a plethora of different treatments over the last decade and because I advocate publicly for myself and other migraineurs, folks always know when I am trying something new. They get their hopes up and are inevitably crushed in one of two ways: either the treatment has no effect on my migraines (or makes them worse) or the treatment is helpful in managing my migraines but fails to eradicate them altogether. As a migraineur and an advocate, I have no expectation of a cure from any medications or treatments. I remain hopeful that they will help me. However, my loved ones have a hard time accepting this and get frustrated and saddened during my first attack after a treatment that seems to have helped. In their minds, I am not “better” unless I am no longer having migraines. In reality, I am much better. At my worst, I used to spend an average of 3 nights a week in the Emergency Room because we couldn’t get my pain or my vomiting under control. Now, I can’t remember the last time I went to the Emergency Room and my migraines are almost exclusively able to be dealt with at home. 6. The hardest part about mornings are: It is difficult to have a regular sleep schedule with migraines, which often results in insomnia. Mornings can be difficult if I’ve spent the previous night tossing and turning or, worse yet, in a great deal of pain and discomfort. 7. My favorite medical TV show is: House, M.D. I still maintain that Hugh Laurie gave the most realistic portrayal of a migraine that I’ve ever seen in the media. 8. A gadget I couldn’t live without is: My cell phone. Not only does it connect me to my friend and family, as well as my doctors, but it also connects me to Facebook where I have wonderful support groups. My cell phone also holds my music collection and, for me, music is as vital to my survival as oxygen. 9. The hardest part about nights are: Nights are sneaky. If you’re in a lot of pain, there aren’t a lot of options other than riding it out or going to the Emergency Room, which is often more harmful than helpful. Nights can feel lonely and everlasting, which is why I’m so grateful to have a boyfriend who’s a night owl, fellow migraineurs who are also frequently awake at night, and friends in different time zones who are always up for a chat! 10. Each day I take 12 pills & vitamins. That’s on a “good” day. If I have a migraine, it’s more. 11. Regarding alternative treatments I: I’m a fan of acupuncture and mindfulness-based stress reduction. I’ve also had some success with Somatic Experiencing and Reiki. To a certain extent, I feel that these things help more with my anxiety (which is definitely a contributing factor to my migraines) but I’ll accept any help I can get! 12. If I had to choose between an invisible illness or visible I would choose: This is not a question that I feel qualified to answer. I don’t have a visible illness so I can’t speak to how that feels. What I can say is that it is extraordinarily difficult to have a disabling disease/condition/disorder that is not visible. Many people tend to approach life with an “I’ll believe it when I see it” attitude…and even when they witness my suffering they sometimes think I’m over-exaggerating the severity of my symptoms. 13. Regarding working and career: It is an awful thing not to be able to work. I’ve had more people than you’d believe say things to me like “It must be nice not to have to go to work” or “I wish I could lay around all day like you do.” To that I say, I’m ready to switch places when you are. You’ll be begging for your job back. To be 30 years old and without a job feels shameful. Not only did I love my job, I was good at it and it brought me an enormous amount of personal fulfillment and joy. I miss teaching every day of my life and I hate being financially dependent on others. I can’t wait until I’m able to manage my migraines in such a way that I am able to work outside the home again. 14. People would be surprised to know: I was urged by one of my college professors to drop out of college. She told me that I had no hope of holding down a job when I couldn’t even consistently make it to class. She said that trying to get my degree was just a waste of my time. I had already taken a few years off from college to work full time and try to get my migraines under control. This was my first year back. Luckily, the folks at Disability Services, another one of my professors, my boyfriend, and my parents all had my back and I graduated with a Bachelor’s Degree in English in the Spring of 2010. 16. Something I never thought I could do with my illness that I did was: I ran a 5k a few years back. I didn’t break any records but I finished the race and that is something that I never thought I could do, with or without migraines. 17. The commercials about my illness: Commercials are often a source of frustration for me because I feel as though they give an unrealistic portrayal of migraines. If Excedrin works for some people, that’s great. However, there’s a large subset of the population that has migraines that are not helped by Excedrin. Don’t you think that I would rather pop an Excedrin than get 31 Botox injections in my face? And while we’re on the subject of Botox (because that has commercials too now): Botox can be an incredibly effective tool in migraine prevention. However, it is not a cure. There currently is no cure for migraine or chronic migraine. There are management options. Please advertise them as such. 18. Something I really miss doing since I was diagnosed is: Enjoying thunderstorms. I know that probably sounds ridiculous but I used to love thunderstorms. Now, the mere mention of rain showers is enough to spin me into a panic attack because my migraines are frequently triggered by the weather. 19. It was really hard to have to give up: Chocolate. Italian cheeses. Pepperoni. Food triggers are tricky for me and I’m generally pretty good about staying away from the things I can’t have. However, my grandmother was full-blooded Italian and she used to make the most incredible meals with Parmesan and Romano cheeses. My grandfather would get me pepperoni sticks from the good Italian deli/bakery. In this case, food is not just food. These foods are memories, a part of my childhood and my identity. I miss not being able to enjoy them, not to mention the hassle it causes trying to avoid them in restaurants or store-prepared foods. 20. A new hobby I have taken up since my diagnosis is: I enjoy blogging about my experiences and connecting with others who have similar diagnoses. It’s important for people to understand that they’re not alone. 21. If I could have one day of feeling normal again I would: I don’t like the phrase “feeling normal.” I’m not even sure I know what that means. I just do my best to enjoy the days that I have. Recently, I went to an Ed Sheeran concert with my boyfriend and it was one of the best nights of my life so far. It’s things like that that show me that I don’t have to be/feel “normal” for my life to be okay or even wonderful. 22. My illness has taught me: I am stronger and more patient than I ever imagined. I’ve endured more than I thought possible. Some people will desert you but the people that stay by your side are the ones you truly want around in the end. 24. But I love it when people: Turn off the lights, mute the sounds, give me an ice pack and a McDonald’s Coke (caffeine helps! ), give me a hug, watch T.V. with me until my meds kick in, tell me that it’s okay and that they love me. I also really appreciate it when people acknowledge how hard I’m fighting and that it must be difficult to be in pain so much. 26. When someone is diagnosed I’d like to tell them: Find a migraine specialist. It DOES make a difference. Advocate for yourself. Ask for what you need. Try many different things and never, ever lose hope. 27. Something that has surprised me about living with an illness is: I’ve developed a certain set of skills (imagine that being said in a Liam Neeson accent) that have proved themselves helpful in a variety of ways for both myself, my loved ones, and other folks in the migraine/chronic pain communities. Learning to advocate for myself as a patient has had a direct effect on my ability to advocate for myself and others in life. 28. The nicest thing someone did for me when I wasn’t feeling well was: One of my former students taped construction paper over the window in our classroom because the shade was broken. He knew that my migraines present with extreme sensitivity to light, so he set about covering all of the windows. He was 8 years old at the time. 29. 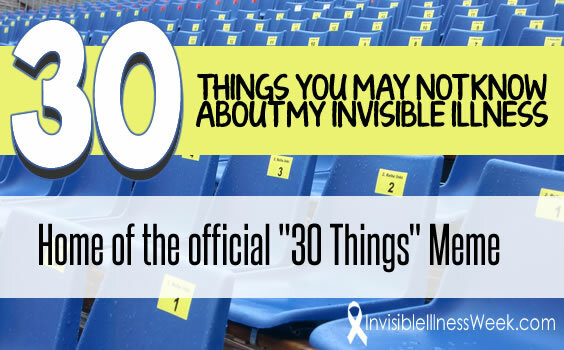 I’m involved with Invisible Illness Week because: Raising awareness and eradicating the stigma surrounding invisible illnesses is paramount. Because you cannot see my illness, I have to speak up about it in order to make you aware of it. I want others to know that they are not alone. I want everyone to know that just because you can’t see my illness doesn’t mean it isn’t there. 30. The fact that you read this list makes me feel: Grateful. To know that someone took the time to read and process my thoughts means the world to me. It means that perhaps next time you won’t be so quick to judge what you cannot see or what you do not understand. Or perhaps now you know that you are not alone. Either way, I believe that I have done what I set out to do. Only 21 hours left to order your “Migraine Warrior” shirts! Thank you for this post. I can relate to a lot of it. I can totally relate! Thank you for your FB article and blog. One of my biggest struggles is getting my fiancé to understand there is no cure. I’m a banker who sits in front of a computer screen all day. It’s killing me. I bought the Icekap earlier in the year and love it. I take the same meds as you currently but have been through a ton and have just started Botox. My biggest triggers are alcohol and the barometric pressure. Certain foods and smells will also do the trick! Just no fun!